Not only does the site have a lot to offer, but it turns out that its creator is a bone fide professional piano player, Daniel Wnukowski, who knows his stuff and is keen to share his wisdom and experience when it comes to learning piano. 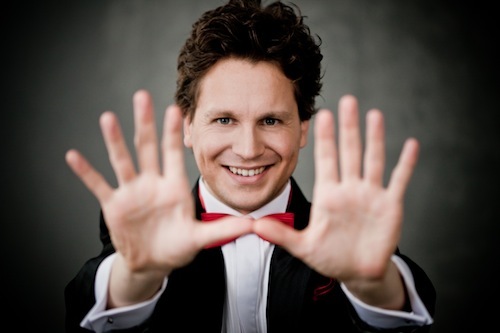 Daniel is a Canadian-born classical pianist with an impressive career. I managed to catch him between gigs on a whirlwind tour of Beethoven concertos to reveal a bit more about his site, its goals, and his take on bringing classical music to the new generations. 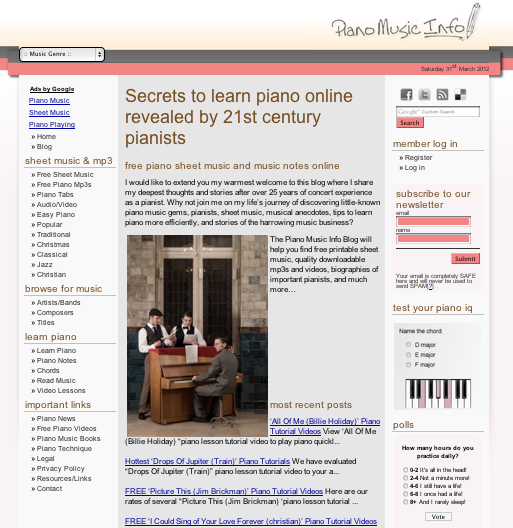 What compelled you to create a free website dedicated to piano learning? The most compelling motivation for creating freepianomusic.org was to create a virtual home in which piano students could find trusted information while bridging the gap between ‘professional’ concert pianists and amateur pianists. With so much data at our fingertips nowadays, it’s easy to get buried in useless information which hinders our capacity to learn piano quickly and effectively – not to mention all of the distractions. There’s a lot of great content on the site! Has it all been your own endeavour or is there a team behind the project? Thank you! Much of the content was written by me or by my trusted colleagues in between our touring schedules as concert pianists. Although I have teaching experience, I am not able to maintain a steady class of students due to my hectic schedule. The good news is that through blogging, I can reach a greater number of pianists and help them to reach new levels in their playing. One of the highlights of our site is an unbiased comparison of classical music recordings. With so many recordings out on the market, each listener has to find out what they like or dislike about a recording rather than relying on what the masses or critics like. Have you had a good response from visitors? Through blogging, I can reach a greater number of pianists and help them to reach new levels in their playing. The response has been fantastic so far with close to a thousand visitors a day and growing. The majority of visitors want to wet their toes in the sea of piano music available out there, perhaps just enough to play their favourite song on the piano or to impress their friends. While others are interested in taking their piano playing to another level while growing their sheet music library. I enjoyed taking the piano quiz! Do you have more interactive features planned? We’ll have more advanced levels of the quiz coming soon. We are also working hard to develop a revolutionary 7-day course which will offer free lessons that would normally cost hundreds of dollars anywhere else. It will soon have many interactive features including video presentations, flash cards, quizzes and colourful charts to help crystallize several important and fundamental concepts required for proper piano technique and performance. Sounds great! What else can we look forward to in the future of freepianomusic.org? We will be posting comprehensive reviews of software and lesson method books, including an examination of the pros and cons of each. I will also be posting Q & A sessions from emails that have been sent to me to help other musicians who may have the same questions. How have you found the advent of digital music and widespread Internet access have affected your musical career? My #1 tip for aspiring pianists would be to find a method of learning that ‘clicks’ and then to stick with it. The good news is that it’s great to have the ability to download piano sheet music instantly and often free. Sometimes, I have taken advantage of this myself by not having to carry 20 heavy books with me on tour. However, the bad news is that the quality of most downloadable sheet music is very mediocre – especially in the classical and jazz fields. Sometimes the print is bad and the manuscript is full of errors and misprints. Books have become more expensive as a result of all the downloading going on, but are definitely a better investment in the long term. Websites like freepianomusic.org are great for removing some of the ‘intimidation factor’ of classical instruments and music, and it’s great to find one started by a serious classical performer. What else do you think classical musicians can do to help reach new generations and encourage them to listen to more classical music? Statistics in Google reveal that the keyword “classical music” is actually searched for by millions of people every month who are desperately trying to get closer to this exciting genre of music, but probably feel too intimidated to go to a live concert. Professional concert performers these days have to find innovative ways to connect with their audiences without compromising their art. For instance, new technology can be used in creative ways to sensitize young, amateur pianists to the nuances found in music while also reaching a wider audience than ever before thought possible. Finally, what would be your #1 tip for aspiring pianists? My #1 tip for aspiring pianists would be to find a method of learning that ‘clicks’ and then to stick with it. For some, this may include finding a helpful method book or online instruction course, while for intermediate/advanced players it may require finding an ideal piano teacher. By sticking with one good approach from the beginning, there will be much less risk of developing bad habits which can be difficult to overcome later on. My sincere thanks to Daniel for finding the time to answer these questions and tell us a bit more about his excellent piano pedagogy site. If you’re a piano student yourself or ever considered taking it up, I’d highly recommend a visit to freepianomusic.org – and it’s certainly a site to keep an eye on as it develops! Update (2016.11.16): this article originally referred to pianomusicinfo.com but has since been updated to reflect the new site address, freepianomusic.org.